Grumpy Cat, the cat who looks grumpy, is on the cover of this week's New York magazine, advertising a profile. The "estimated value" of Grumpy Cat, Ltd., the Grumpy Cat company, is $1 million. The profile, called "Grumpy Cat," really concerns Grumpy Cat's manager, Ben Lashes, the indie rocker turned meme hustler. ("'Grumpy Cat pimps it,' Lashes explains. Lashes sips a Corona at the Standard’s bar, his fedora cocked slightly.") 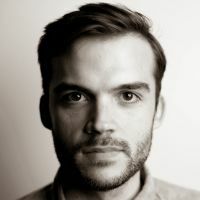 Lashes also represents Keyboard Cat, among others; if you follow certain Buzzfeed employees on Twitter, you can get a good sense of what else he represents since he and his clients visit the publication's offices frequently. "A sharp legal team is crucial," writer Katie Van Sycle explains about Lashes' operation, "because Grumpy Cat’s ability to make money depends on protecting her likeness, a problem meme-based celebrities are especially vulnerable to." Indeed: As anywhere on the internet, protecting intellectual property is key for the ability of creators to make a living. Grumpy Cat, though, is less a "creation" than a kind of... natural resource, from which its owners extract rent. (In this way it is an excellent cover model for a package on the 2013 economy.) The real "creators" aren't Grumpy Cat's owners but those who use Grumpy Cat's likeness to create content: Photoshops, image macros, and so forth. 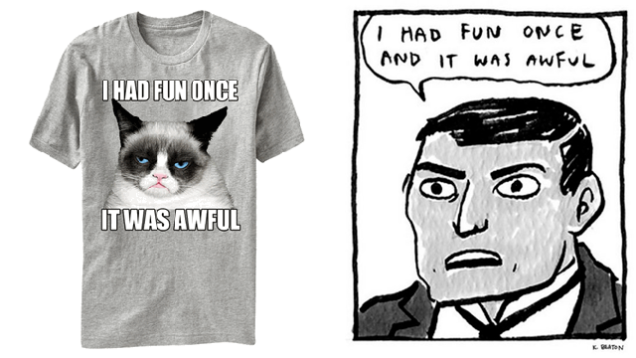 One of Grumpy Cat's most popular items of merchandise is a t-shirt with a photo of Grumpy Cat, with the caption: "I HAD FUN ONCE/IT WAS AWFUL." The t-shirt is based on a popular image macro (one that was not created by Grumpy Cat's owners or Lashes, but by a Reddit user). The caption is lifted directly from another meme, a panel from the comic "Hark! A Vagrant," by the Canadian comics artist Kate Beaton. No, I never authorized anything. And some people will argue that I never wrote the joke, that it's "been around forever." But I made a comic, and one panel became a meme, and that's fine. The nature of a joke is to take on a life of its own. At some point, the meme was applied to Grumpy Cat, where it fit well. It is only how Grumpy Cat is aggressive about protecting their brand with that joke as part of it that has ever rubbed me the wrong way. But it's not like I can do anything about it, and I suppose I'd get a lot of grief anyway if I tried. I think it's just an example of people not caring where content on the internet comes from, until they are the ones making it. Then it's important. "[I]n an industry where royalties are typically between 6 and 10 percent of an item’s wholesale price," Van Syckle writes, "those copyright battles are worth the fight. ('No one’s a chump,' Lashes says. 'We’ve got a saying over here in team meme: "Respect the cat."')"